The lazy summer evenings have given way to cooler autumn nights, so it’s time to bring out the slow cooker and enjoy some comfort food. As the temperature drops, the hankering for hearty, comfort food begins, and there’s something marvellous about coming home to the smell of a rich, autumnal meal already underway. Slow cookers are a wonderful way to cook comfort food. They preserve the tenderness of the meat, and they’re a convenient way to prepare food when you have a busy lifestyle. 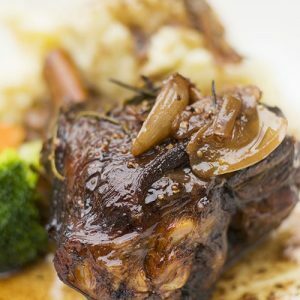 Lamb shanks work well in a slow cooker, and with little effort, produce a delicious meal for the family. While this recipe suggests cooking on high for the duration, you can set your slow cooker to cook at a lower setting for a longer period. This will produce an even more tender result. But don’t cook it too long or it will slide right off the bone. Check the butchery department at Fresh Choice Nelson for expertly prepared lamb portions. The rest of the ingredients are available in their well-stocked aisles. As an alternative, substitute the rosemary for some cumin, coriander and curry leaves to spice things up! Pair this recipe with some creamy mash and your favourite seasonal vegetable for a wholesome meal, rich in protein and iron. Rub the lamb shanks in the seasoned flour and fry in the frying pan for a few minutes, turning until browned all over. Place the lamb shanks in your slow cooker. Deglaze (rinse the bottom of the pan to soften the caramelisation) the frying pan with the red wine and continue to cook for two to three minutes, or until the volume of the liquid has reduced by half. Pour the liquid into the slow cooker. Add the onion, rosemary, bay leaves and stock to the slow cooker. The liquid should cover the meat. Add more stock if needed. Cook on high for eight hours. Sit back and enjoy your comfort food on a Nelson winter evening!